Near the end of the 1990's, I wrote that Le Bernardin was the greatest restaurant in America, the most perceptive critique of my career. As the years passed, the restaurant never faltered, an amazing run, first under Chef Gilbert Le Coze and his sister, Maguy Le Coze, presently under Chef Eric Ripert and his partner, Maguy Le Coze. I admire Le Bernardin as much as ever, maybe more, now that a new no-reservation lounge is offering light dining, including Ripert's greatest hits (luxurious lobster cappuccino with coral foam, clever caviar croque monsieur, and curiously bold kampachi topped with wasabi-infused tobiko). 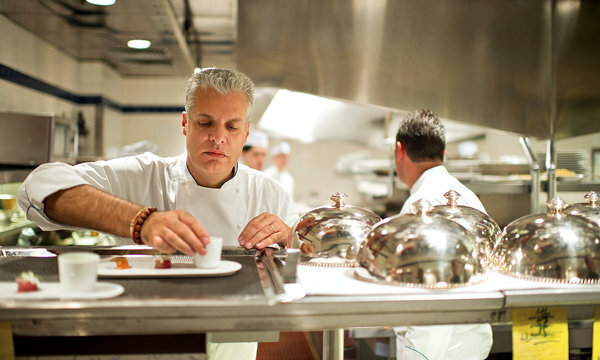 Ripert remains the most talented seafood chef on earth. Aldo Sohn is still the best sommelier you'll ever come across, and the new pastry chef, Laurie Jon Moran, is not only darned good, he shows signs of being a sorbet savant. 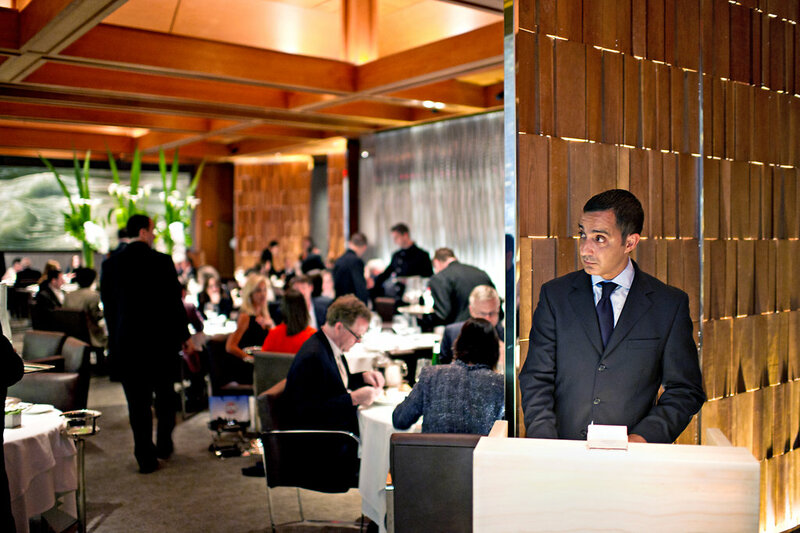 After a recent renovation, Le Bernardin is a little less handsome than before, slightly more gentle and flowing. The food is no longer particularly French and hasn't been for awhile, but Ripert makes fish taste fabulous in any language. Try the charred octopus cooked three ways and served with three sauces (that might sound like too much, but it isn't), langoustine with a sliver of foie gras and white balsamic dressing (that might sound like the best thing you ever ate and possibly is), and his Sea Medley, done Japanese-style with dashi and custard, but elevated with an array of small ocean creatures. Despite all that—and a diner could hardly hope for more—I no longer think Le Bernardin is the most exciting and exhilarating restaurant in New York. 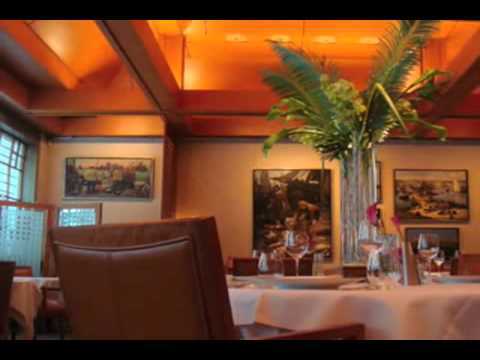 At the same time, I still feel in my heart that Le Bernardin is the best restaurant in America. That might sound like a pronouncement from a befuddled mind, but enduring greatness should not be penalized. 155 West 51st Street (Seventh Avenue); (212) 554-1515; le-bernardin.com. ATMOSPHERE After a redesign, the monumental dining room feels slightly more intimate and even romantic. SERVICE Always correct, the servers are a little more likely to break into a smile these days. SOUND LEVEL Never rises above a pleasant background murmur. RECOMMENDED Geoduck, fluke sashimi, sepia, sea medley, langoustine, red snapper, black bass, halibut, piña colada dessert, yuzu meringue tart. PRICES Lunch: $70 three-course prix fixe; $190 eight-course tasting menu. Dinner: $125 four-course prix fixe; $145 seven-course or $190 eight-course tasting menus. HOURS Lunch: Monday to Friday, noon to 2:30 p.m. Monday to Thursday, 5:15 to 10:30 p.m.; Friday and Saturday, 5:15 to 11 p.m. WHEELCHAIR ACCESS The dining room and accessible restrooms are on street level.